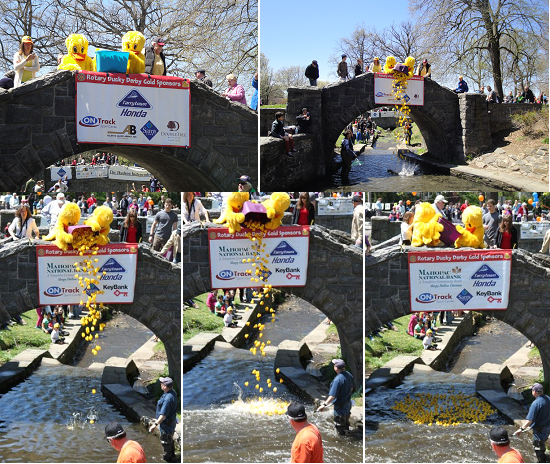 The idea of racing rubber duckies took awhile for our club to accept. In fact, our fellow Rotarian Mimi Godwin had to spend several years trying to convince us to say yes. Once we agreed to this crazy idea we had to find a place to race! The Hudson River? The Tarrytown Lakes? Rotarians Tommy Basher and Gerry Barbelet came to the rescue. Patriots Park would become our home and with the help of the fire department Andres Brook would become a mighty water source. We also decided to collaborate with the YMCA and have our event run alongside their Healthy Kids Day. In April 2008 our event was born and our villages were forever changed. It was, and still is, like a Norman Rockwell, painting. This event is a true community event where everyone comes to the park to walk around. Whether one is watching the duck races, following our costumed ducks around, having their children partake in the YMCA’s events, getting some food or listening to music, there is definitely something for everyone. As a club, we are so pleased to bring so many people, from throughout our community and region together. Please help us raise funds for our Tarrytown Rotary Club’s Scholarship & Community Grants fund. The monies we raise go directly back to our community. All it takes is $10 to make so many dreams come true. Thanks!